Outage Centre Created with Sketch. We want to be recognised as setting the standard for Health, Safety and Environmental leadership for New Zealand businesses. Our management of health, safety and the environment is underpinned by key policies (Health and Safety, Process Safety, Environmental, Rehabilitation and Drug and Alcohol). Our Health, Safety and Environmental Management System (HSEMS) details the minimum requirements for all Vector business units, subsidiaries and employees. Compliance to these standards is audited on an annual basis with results being shared with the board. The board also receives monthly HSE performance reports detailing injury statistics, drug and alcohol testing, near miss reporting, process safety KPI progress and updates on key HSE matters. Our safety management systems are audited both internally and externally on an annual basis. These objectives are supported by more detailed and measurable one, two and three year initiatives and key performance indicators. Each business unit has an annual HSE improvement plan which supports the achievement of the group strategy. Our HSE performance is measured using a number of lead and lag indicators. These include HSE engagements by senior managements, employee uptake of occupational health services, annual leave days taken and owing, lost time injury frequency rate (LTIFR), and total recordable incident frequency rate (TRIFR). The severity of lost time incidents is measured by tracking and counting the number of working days lost due to the injury. We consolidate all contractor and employee safety statistics to provide a holistic picture of safety performance in our business. Our safety record is the result of a long programme of ongoing, proactive work and a wide range of educational and practical programmes with employees, suppliers and contractors. As our health and safety performance has improved, we’ve been able to start shifting our focus from lag indicators like Total Recordable Injury Frequency rates (TRIFR) which are based on incidents that have already occurred, to lead indicators that measure proactive activities that prevent incidents occurring. Lead indicator measures include mandatory health, safety and environment-focused site visits by employees in senior positions, health and safety culture and leadership training, auditing programmes, and an extensive programme of work that examines the human factors that contribute to workplace incidents. Vector’s HEART (Human Error Assessment and Reduction Techniques) programme is based on the understanding that no one goes to work intending to be injured, and that the decisions and actions workers take make sense to them at the time given their goals, experiences, knowledge, motivation and focus of attention. However, mistakes are made and incidents do happen. As an employer, it is our responsibility to create the conditions where the causes of human errors can be identified, managed and controlled to minimise their frequency and impact as much as possible. An important part of this is understanding the root cause of errors; that is, why an individual may take a particular course of action which may result in an incident. 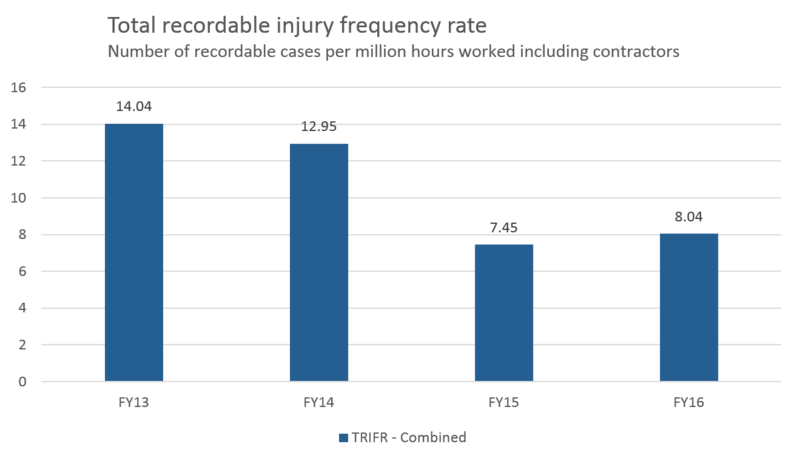 We have made solid progress on reducing our Total Recordable Incident Frequency Rate (TRIFR) over the last few years. 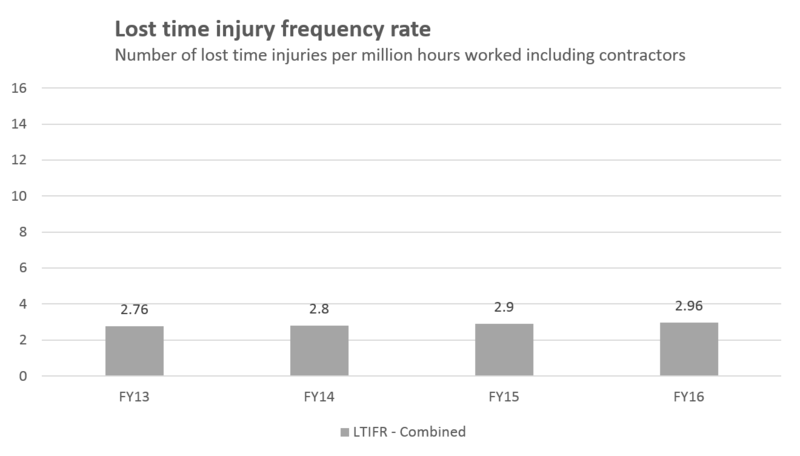 In 2013 our TRIFR was 14.04 injuries sustained per million hours worked; this dropped to 8.04 by the close of our 2015/16 financial year. 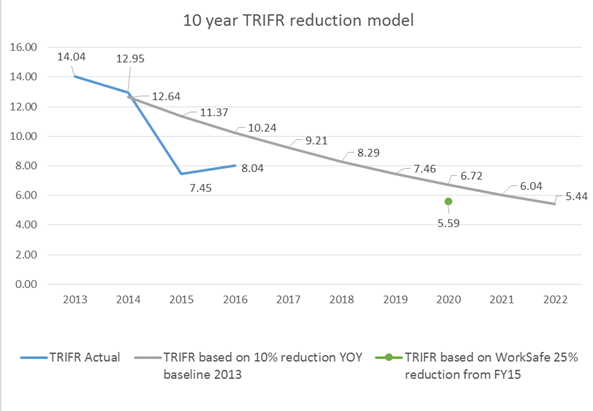 The graph below shows the milestones we would need to reach if we were to make a steady 10% year-on-year reduction. Based on these milestones we would have needed to have achieved a TRIFR of 10.24 in 2016; so we have beaten this by 21.48% despite a small increase on last year’s dramatic 42.50% reduction in injuries compared to 2014. We strive to achieve a year-on-year reduction in injuries and make a significant contribution to Worksafe’s 2020 goal, while becoming an even better and safer employer for our employees every day. We also provide extensive occupational health services to employees. Nurses visit our larger locations on a weekly basis and our smaller locations on a monthly basis, however all employees have access to occupational health services when they need it. In 2015 our OnGas part of the business was one of three finalists in the SafeGuard awards – for the Category - Occupational Health: WorkSafe New Zealand best initiative to address a health risk. While we did not win the category, it was a great recognition of the hard work our teams have done to improve the health and wellbeing of the OnGas team. Through our Environmental policy we strive for continual improvement in our environmental performance. To achieve this, the environmental components of our health, safety and environmental management system (HSEMS) align with ISO14001:2015. We have identified the environmental aspects associated with our operational activities, products and services and strive to reduce our biggest impacts. As with other large industrial operators, one of Vector’s most significant environmental impacts is the emission of greenhouse gases. Vector aims to improve the measurement of its carbon footprint throughout FY17, and publicly disclose the result in our FY17 annual report. Vector has a growing focus on renewable technologies such as solar and batteries. Introduction of LED lights and water aerators to reduce energy and water consumption. Created with Sketch. Shape Created with Sketch. Visit our investor section for more information.